This file contains information on services and procedures provided to Medicare beneficiaries by every physician, health care professional and facility enrolled in Medicare, information on the services performed by each physician, each physician’s specialty and geographic location, the number of beneficiaries treated, charges submitted by providers and payments from Medicare. The data allow the public and health care marketplace a unique glimpse into previously unreleased information on Medicare utilization and payments — where procedures are being performed and by whom, whether care is delivered in a facility or office setting, how much providers charge for their services and what providers receive in payments from Medicare. The Physician and Other Supplier update is the third year of data of this type released by CMS. With 2012 – 2014 data now available, users can conduct different point in time analyses as well as preliminary trend analyses such as identifying doctors who billed for certain services or products in 2012 and/or 2013 but ceased to do so in 2014. 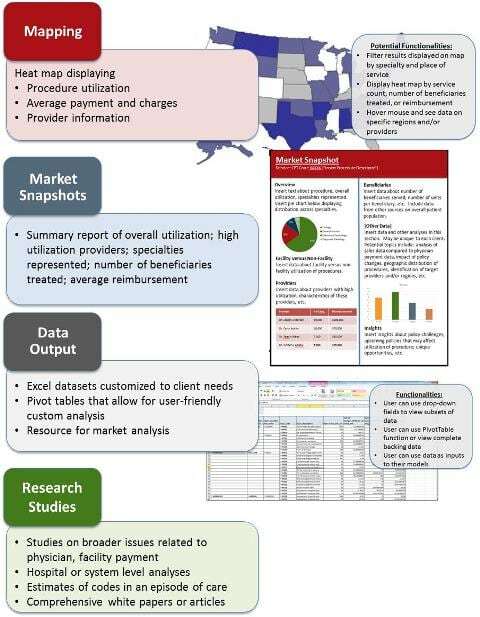 Inpatient Prospective Payment System (IPPS) data sets. In addition to the analyses discussed above, McDermottPlus offers customized reports and analyses based on individual needs. Please contact McDermottPlus at +1 202 204 1450 to discuss these analyses or custom requests that you may have.